History: She was born to two loving parents, who have cared for her up to this day. Her aunt is a skilled huntress who had trained with her up until the point where she went to combat school to become a huntress herself. She went there with a goal of becoming a huntress no matter what, due to her admiration of her aunt, and her families history of being an honorable line of hunters. The Hywell family has been known for its exploits against the grimm, they were responsible for many of the advancements in weapon and defensive technology and are crucial in the war against the grimm. However they have made enemies in other families, due to ethically questionable tactics used during battle and during covert missions. After she had finished combat school she was immediately accepted into beacon due to her high scores on tests of all kind and strong leadership skills. She and her team had performed well in their first year at beacon, becoming a favorite of the instructors and wiping the floor with the competition during the Vytal tournament. However, with her aunt having become sick this year, she is more distressed and less calm than usual. Her teammates are now worried about her as the stress continues to pile on. 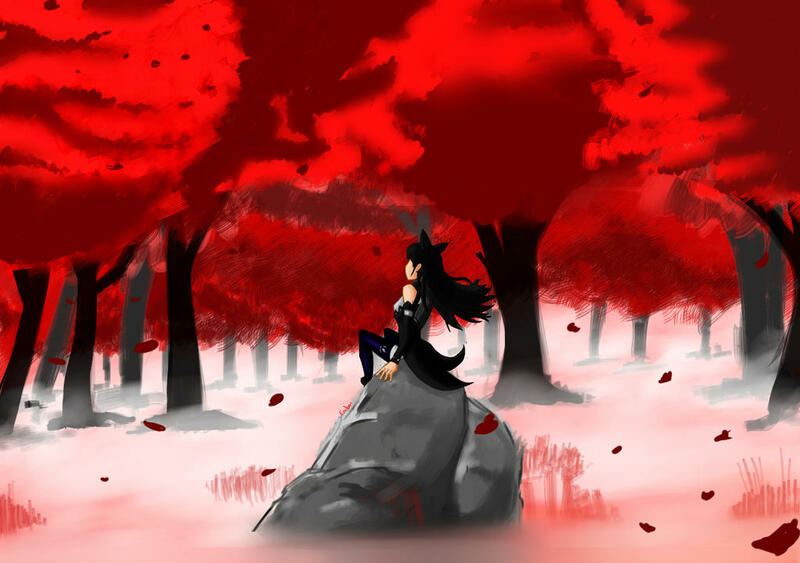 She has combat experience against both hostile humans, faunus, and grimm, but has made an oath to never kill humans or faunus. Personality: She is for the most part very gentle. She is kind to her peers and attempts diplomacy before violence. She loves her family very much and is a bit of a romantic herself. She is incredibly determined to become a huntress, sometimes even letting her ambition get the best of her gentle personality. She is not very good when it comes to losing, having been raised as someone who was taught to win, usually getting what she wanted. Strength: She is a very strong leader in that she is skilled in combat but also skilled as a diplomat. She is capable of talking down enemies in order to avoid violence, resolving issues peacefully. She is also very capable at stealth and assassination, knowing a lot about weak points in the body and poisons. Weakness: Despite being able to keep her cool and remain calm in most situations, she gets stressed out very easily, her sanity seeming to almost snap sometimes, always teetering on the edge of her own mind. She's also incredibly incapable of believing she'll lose, although she is not vocal about it. Her aunt and her family is also a weak point for her, with her aunt ill at the moment she is more stressed and emotionally vulnerable than usual. While she's a good leader in every other way, she has trouble directing a team in combat, usually forgetting they are even there and taking on enemies herself due to her training in stealth. She is also not physically strong, preferring to use knowledge of her enemy and her semblance instead of raw strength. Semblance: Her semblance's effect is one that changes depending on her emotional state. It is fire-based but not necessarily volatile fire like many other characters. Hers is a warm fire that she can use to calm people or animals down. She can also turn her fire black for stealth purposes, she can also use it to "melt down" and observe situations from any source of fire in the vicinity, she does this by becoming an almost formless cloud of smoke (it is still tangible and she can be killed in this form) and traveling to a fire and hiding in it, if she can sense other sources of fire then she can move to that as well. She can only access fires that are about the size of a fireplace, she cannot hide in candles, lanterns, etc. When she enters the smoke form, all of her senses are disabled except that she can sense fire and living things, when she enters the fireplace, her senses are regained and she can observe, she can also only change back to her normal human form from fire. If she runs out of aura while still in the smoke form she will immediately lose consciousness and return to human form. When she becomes angry, the fire grows more violent and harder to control, making healing an impossibility when her emotions are out of control. When she is scared, the fire becomes smokier and less visible. Name: The name of your weapon(s). Secondary Form: Perpetual Motion is transformed by loading a dust capsule into a chamber near the hilt. Once it is transformed the weapon's true nature is revealed. In this form it is a multi-use combat weapon that allows many dirty tricks and combat tactics. It extends to about 3/2 of its size in the primary form. It can be separated into knives for stealth or throwing purposes. When it is separated, the blade must be "broken" to reveal a small dust cannon near the hilt. The dust cannon is stored here for use as a surprise weapon to get her out of a tight spot, or when the sword is separated into knives it will be wielded alongside the knives. While in the connected form, Perpetual Motion can be charged with dust and swung to release a wave of elemental energy. While it can be loaded with most kinds of elemental dust it is usually loaded with fire to match with its wielder. Tertiary Form: When loaded with a special kind of dust canister, Perpetual Motion can be overcharged to have stronger dust blasts from the cannon and the swings. This should only be used as a last resort in combat as collateral damage is very possible and can be dangerous to the user and those around her. The kind of dust canister required to activate the tertiary form has to be filled with refined dust that cannot be found in stores. Habren acquires this kind of dust from her family, as they had made large advancements in dust technology in the past, having access to high quality dust. I suggest expanding more on strengths and weaknesses. Like how they affect her in battle, be it with grimm or with people such as what aspect with taking down enemies, through what means? Strength? Technique? With regards to weaknesses I suggest adding some more battle/physically related stuff, not just psychological weaknesses. Weapon seems ok except for the rare dust canister thing, you might have to specify why the dust canister is rare or what kind of dust it is that makes it so. It'll also be good to specify how many knives you could form with the sword, such as 2-4 semi-long knives or 4-8 much smaller knives for various purposes. Ok, I'm good with weaknesses and strengths but I'm not so sure about one part of the semblance. Turning into a puff of smoke would render her intangible and practically invincible to physical attacks and hiding in fire won't seem that practical or fair especially if she could hide in a fire the size of a torch. You might have to change that to something more practical or possible, example being using a shroud of smoke to conceal herself in the shadows, things like that or you might have to add a severe drawback or limit to that smoke puff though I doubt the other reviewers would approve. Also to possibly add if she is able to manipulate other fires or just her own because, considering the multitude of "fire-benders", there might be a problem with controlling other fires or "hiding in them" and also because it seems she might be fond of using fire dust as stated above. Another question to be posed could be, can she be harmed by other sources of fire or harmed by her own fire(anger?). So I changed it so that her ability has her become an almost formless cloud of smoke that's still tangible, I also limited her options in hiding places to fires the size of a fireplace. I guess it's good unless someone else sees a problem with it. I'm really not fond of the semblance. I do like that certain bits have a weakness, but it just seems like way too many things rolled in to one. Healing+stealth+life sense just seems really powerful to me. I'm fine with healing on its own, even though it hurts my brain to think about fire healing, or the stealth+life sense but no real combat capabilities. I'd appreciate if you'd pick one of those, rather than both. Everything else looks fine, though. I don't like the semblance very much. It feels like two entirely seperate semblances, each with several abilities and applications. I can approve this if you either remove the smoke ability entirely, or remove the flame ability and the teleporting via flames ability. Being able to turn into a cloud is more than enough in my oppinion. I have already removed a large part of the flame ability, there was never any teleporting via flames ability in my semblance. Basically the main part of the semblance is the smoke ability that can be hard to control depending on her emotions. If she is calm then her fire is calm. If she is angry then she can't control her flames and may end up hurting herself or others. The only other ability her semblance has is just that her flames won't hurt people if they touch them, being the whole calming fire thing. In order to replace being burnt I had to give the flames another feeling, so being touched by them just means you have this calming feeling washing over you. I am uncertain about your semblance, but I'm going to approve it and we'll see how it goes.